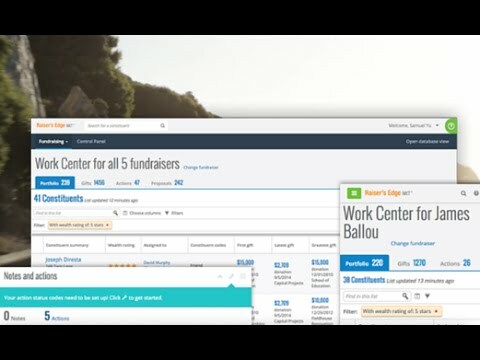 Raiser’s Edge NXT is a cloud based fundraising & donor relationship management software designed to cater the needs of small and midsize nonprofit organizations that offers donor management, contact management, database management and automatic payment functionalities within a single solution. The campaign management functionality of Raiser's Edge NXT enables marketers to send analytics driven campaigns, collect online donations, initiate crowdfunding efforts and measure campaign performance. The donor management functionality of the software enables users to remotely track and manage the performance of the portfolio and pipelines, track multiple touchpoints, assign actions, find major donors and estimate how much to request from them. Raiser's Edge NXT's features include database management to help users keep their organizational data clean and accurate whilst data enrichment services help users automatically update contact information. This in turn helps users to reduce their campaign bounce rates. With the help of customized reporting and dashboards to accurately track the health of the organization’s fundraising efforts, users gain a complete view of all their fundraising activities and are better equipped in making decisions regarding their donor management practices. How does Raiser's Edge NXT compare with other Nonprofit apps? Ease of pulling specific data out of the database. Easy to use and vendor willing to work with us on price. Many features, reasonable price (except for training modules). The survey add-on is cheap (in incremental dollars). It allows download of data to Excel. Lacks a robust query tool. There isn't anything I dislike about the product. Honest. Price. Multiple add-ons. Occasional downtime, as we are a hosted organization. The only con is the price. It is expensive for a small non-profit. Other then that no other cons .. The donor management functionality of the software allows users to manage the donor portfolio and donation pipeline remotely. Analytics functionality helps marketers effectively drive data-driven campaigns and track the performance of each of their efforts. Relationship management allows users to reach out donors using targeted messages from multiple channels. Wealth Analytics feature allows users to find out bid donors and the amount they can be requested. Below are some frequently asked questions for Raiser's Edge NXT. Q. What type of pricing plans does Raiser's Edge NXT offer? Q. Who are the typical users of Raiser's Edge NXT? Q. What languages does Raiser's Edge NXT support? Q. Does Raiser's Edge NXT support mobile devices? Q. Does Raiser's Edge NXT offer an API? Yes, Raiser's Edge NXT has an API available for use. Q. What other apps does Raiser's Edge NXT integrate with? Q. What level of support does Raiser's Edge NXT offer? Q. Which apps is Raiser's Edge NXT compared to most often?